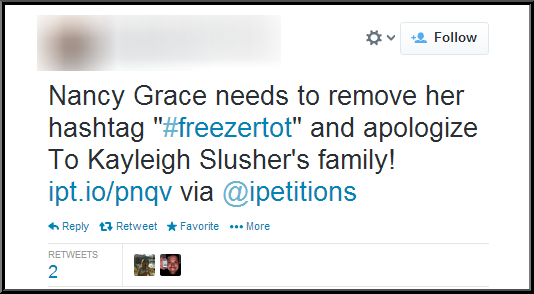 Last night, Nancy Grace took to Twitter and used the hashtag #freezertot referencing the murder of 3-year-old Kayleigh Slusher. Kayleigh Slusher was found dead in her home on Saturday. Her mom, Sarah Kreuger and her boyfriend, Ryan Scott Warner are now in the Napa County Jail charged with Murder and Child Abuse Resulting in Death. Both charges carry 25-life sentences if convicted. 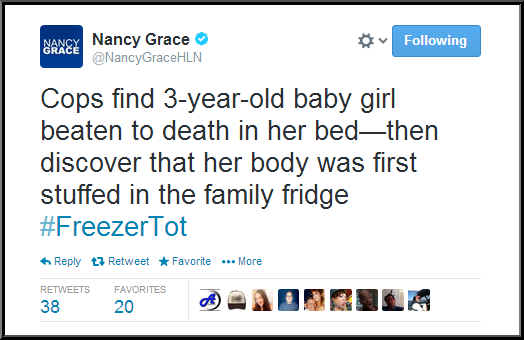 Kayleigh’s mother admitted storing the little girl in a freezer for 3 days. A disturbing admission. 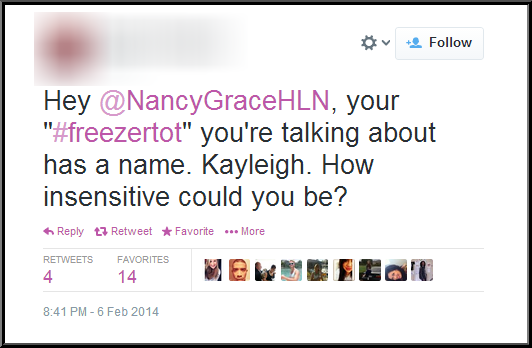 The outrage about this hashtag was all over Twitter Thursday night, calling Nancy Insensitive and demanding she apologize to Kayleigh’s family. Sara Krueger was a doting mother to her 3-year-old daughter until her boyfriend moved into her Napa apartment a year ago and the couple began using methamphetamine, police and neighbors said. Soon, Kayleigh Slusher, a happy pigtailed girl who liked to dress up like Barbie and Minnie Mouse, became a downcast figure who rarely ventured out. When she did, neighbors said, she looked like a zombie, with dark circles around her eyes. 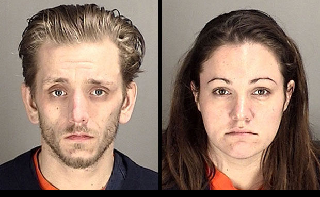 Now, residents of the Royal Garden apartment complex on Wilkins Avenue are struggling to understand what allegedly led Krueger, 23, and her boyfriend, 26-year-old Ryan Scott Warner, to kill Kayleigh, whose body was found in her bed Saturday. The girl had suffered blunt-force trauma and appeared to have been sexually assaulted, said Napa police Lt. Debbie Peecook. The couple, who don’t own a car, were spotted leaving the apartment Saturday morning with luggage, authorities said. The next day, they fled after being spotted at a pancake restaurant on San Pablo Avenue in El Cerrito and were detained by BART police at the nearby El Cerrito del Norte Station. Napa police arrested the couple on suspicion of murder and assault on a child resulting in death. The two are expected to appear Tuesday in Napa County Superior Court pending a review of the case by prosecutors. Police officers had been called several times to the couple’s home to investigate disturbances, but no arrests were ever made, Peecook said. The most recent visit was Thursday, she said, when officers conducted a welfare check and confirmed that the girl, whose father is in prison, was all right. There had been no calls about Kayleigh to the Napa County agency in charge of protecting children from abuse, authorities said. 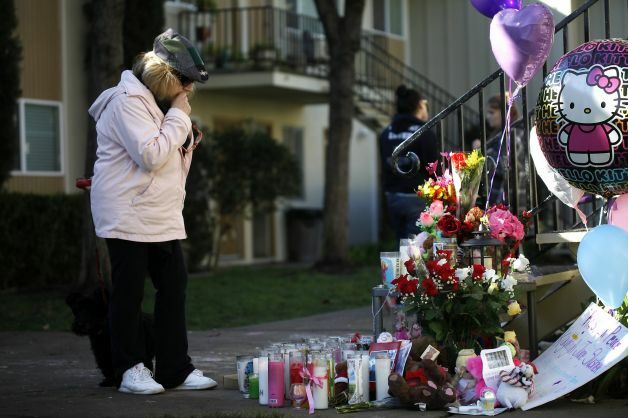 A resident and property manager of the complex, Elizabeth Chechourka, said Krueger had been a good mother who never let Kayleigh out of her sight, even when the little girl would ride her pink and white Hello Kitty bike in the courtyard. 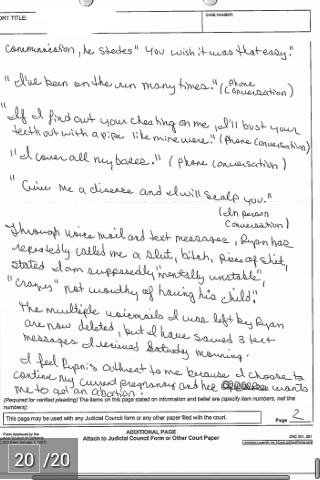 Krueger was outside every day, smoking or spending time with her daughter. She was going to school, studying to become a preschool teacher. That all changed when Warner moved in, Chechourka said. The couple closed the curtains, used drugs and rarely ventured outside, she said, and Kayleigh came out infrequently. On the rare occasions that she saw the family, Chechourka said she noticed that Krueger had lost a lot of weight and that Kayleigh looked sad. The apartment management sent Krueger a letter several weeks ago due to complaints about noise, a stream of people coming in and out of the apartment, and the fact that Warner wasn’t on the lease. The letter warned the mother that she was “being watched by the police department and that if she didn’t want to lose her housing and lose her apartment, she needed to get rid of the traffic within 24 hours,” Chechourka said. She said she was horrified to see Kayleigh being brought out of the apartment in a body bag. 3-year-old Kayleigh Slusher was beaten to death. Her mother Sarah Kreuger and her boyfriend Ryan Scott Warner were arrested at the El Cerrito BART station Sunday. This is an obvious failure of the system. Napa Police were dispatched twice last week to the apartment. 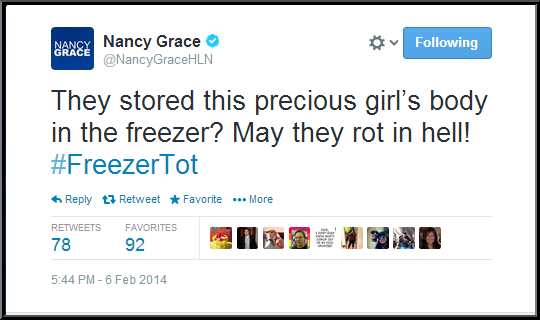 The first time was on Jan 27th for a disturbance. 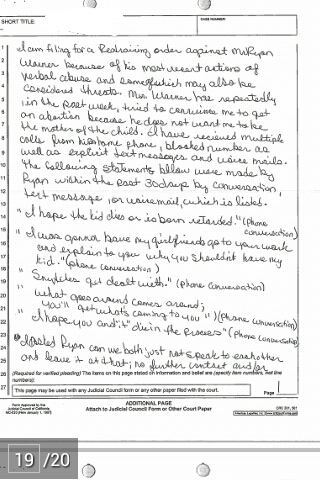 No one was arrested “it was an argument.” The second time was last Wednesday at 6pm “for a welfare check” after the police recieved reports the little girl wasn’t being fed and Kreuger was under the influence.